I'm craving some homemade applesauce and crispy, fresh apples so we're hoping to make our way to an apple orchard this weekend. I've noticed several other blogs writing about orchard trips and apple books and projects this week. 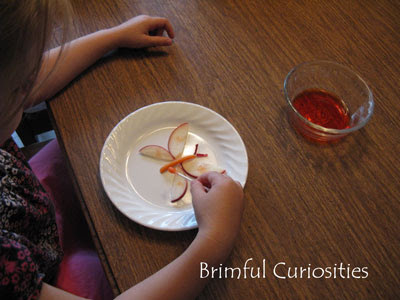 Thought we'd chime in with a book suggestion of our own and an easy-peasy edible apple craft for today's StArt post. I'm not sure how Apples, Apples, Apples made it's way into our library book bag last week, but it did! My daughter may have recognized the bunny character on the cover. We own one another of Nancy Elizabeth Wallace's books titled, Fly, Monarch! Fly! and the same characters appear in both books. Two young bunnies, Minna and Pip, travel to an apple orchard with their Mom and Dad. They meet Mr. Miller, the apple farmer, who teaches them about different apple varieties and how to pick apples. He also points out the parts of an apple and describes tree growing practices. The bunnies return home and make some yummy cinnamon apple sauce. In her Minna and Pip books, Wallace includes informational text intermixed with dialogue between the rabbits. I really like how this book teaches but also tells a simple story. The text isn't exactly riveting, but the illustrations certainly make up for anything the text lacks. Wallace uses a collage technique to construct her illustrations and her cut-paper artwork is very lovely. Wallace successfully incorporates a craft, a song and even a recipe into this book - another one of her picture books signatures. 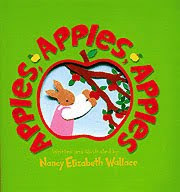 It's really a perfect book to use in preschool and kindergarten apple unit lessons and fun to read before visits to an orchard. Since we read both Apples, Apples, Apples and Fly, Monarch! Fly! this week, I thought it would be fun to make a craft that corresponds with both books. 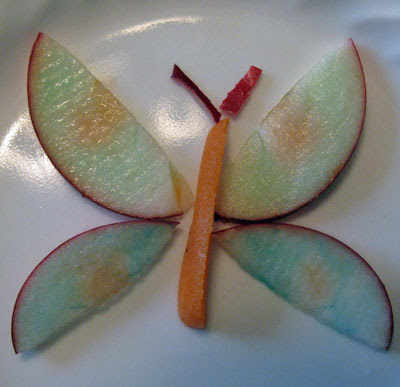 These Edible Painted Apple Butterflies from perpetualpreschool.com are so pretty and double as a delicious snack. My daughter really loved this painting project and pretended she was a Disney fairy painting butterfly wings (the new fairy movie coming out, Tinker Bell and the Great Fairy Rescue, shows fairies painting butterflies). My toddler son liked experimenting with the colors, but he also really enjoyed eating his butterfly wings! You can make several butterflies from one apple. Directions: Quarter an apple and cut into thin slices, leaving the skin on. Arrange four slices into the shape of a butterfly and place a sliver of carrot in the middle for the body and apple peel for antennae. Mix up some food color water paint by placing various food color drops into small bowls filled with a little water. Use q-tips to paint patterns on the wings. A Mommy's Adventures hosts the "stART" meme (Story + Art) each week. Homeschool Creations hosts the weekly Preschool Corner link-up, a place to share activities for preschool and 5K. Add your kids craft post to the Kid's Get Crafty linky at Red Ted Art's Blog. Oooh what a clever food craft! How fun! Great way to eat some fruit and explore art!! And thank you for linking up to Kids Get Crafty! Much appreciated!! Fabulous! This is so cool. Now I know what snack is tomorrow. What a FABULOUS idea for a snack!! Adding this one to my apple theme next week! I would love to link back to it along with our book so our readers can use this fun idea too, I hope that is okay! That is so cute, Selena would love this activity, to eat it would be another subject all of its own. I love this idea! I don't know if I could keep JDaniel from eating the apple before he could paint it. Wonderful post!! I love Nancy Wallace's books - they are absolutely adorable! Thank you for sharing the extra links, too, for follow-up activities!! I really enjoyed this post! 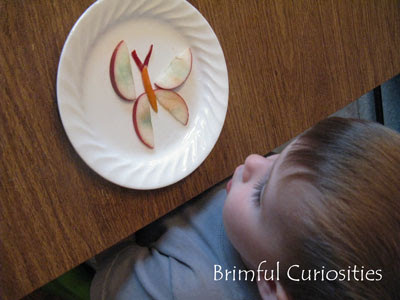 I am excited to feature this food/butterfly activity with the book!! Cute idea. This is one of my daughter's favorite books! Love it...I should do more crafts with food with my kids! Maybe my toddler will actually sit still and eat!